Despite marmalade rapidly disappearing from the British breakfast table, the arrival of Seville oranges every january is eagerly awaited by thousands of avid marmalade makers. When delving into its heritage then the Greeks and the Romans were bound to pop up - although the Portuguese seem to have had a hand in it to. 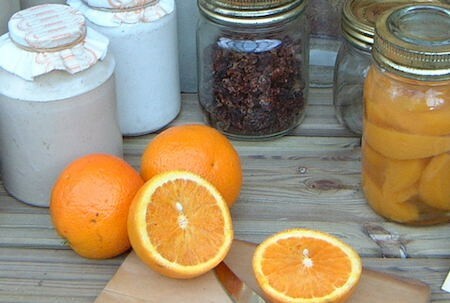 But whilst it was a fruit paste of sorts, they all seem to have used quinces rather than oranges. 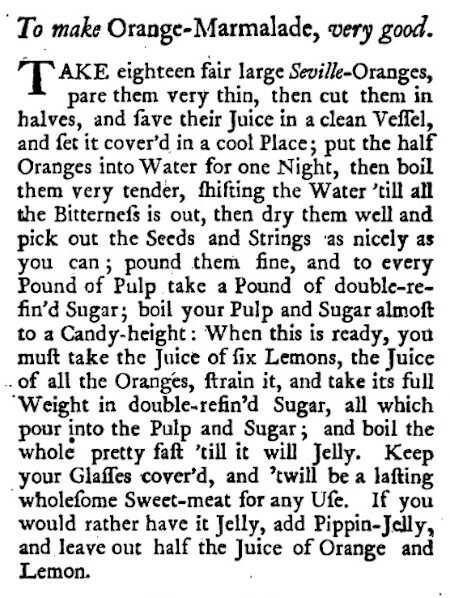 Although the first printed recipe for orange marmalade appears to have been in Mary Kettilby&apos;s 1714 cookery book, A Collection of above Three Hundred Receipts, our favourite story is that marmalade was invented in 1700, when a storm-damaged Spanish ship, carrying Seville oranges, sought refuge in Dundee harbour. The cargo was sold off cheaply to James Keiller, a down-on-his-luck local merchant, whose wife turned it into a preserve. As fanciful as it sounds, it is a myth which will do very nicely. Nevertheless, what is fact is that the Keillers were the first to establish a marmalade factory in 1797 and their Dundee marmalade in stoneware jars was affordable enough for many families. Doubtless that recipe was a closely-guarded secret, even though the company changed hands many times and is now part of a faceless American conglomerate. 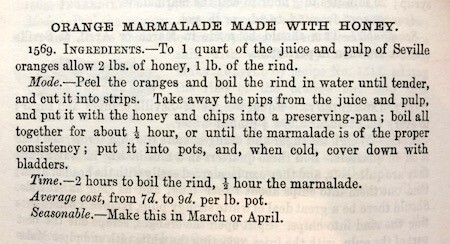 So Victorian households would probably turned to Mrs Beeton for their marmalade recipe. This one from her Book of Household Management used honey instead of sugar. With the Victorians being the great inventos of gadgets they would have wanted a solution to the tiring and time-consuming shredding of orange peel for the rinds and pounds of preserve that would have to be made. 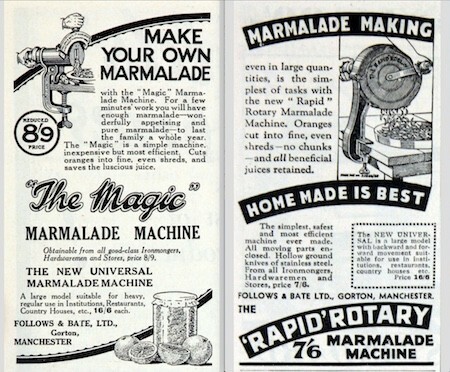 So along came Manchester foundry with their marmalade machines. Made from cast iron or tin, they provided the answer to the needs of every institution, estate or modest home. 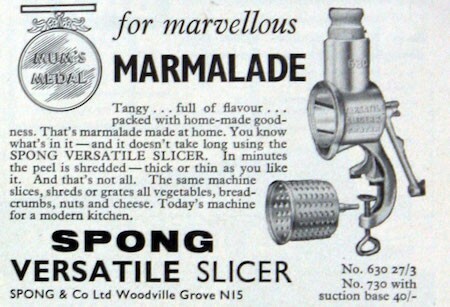 Spong also produced a rotary marmalade slicer: Early versions were japanned but whilst the design stayed the same throughout the 20th century, it took a modern look with unfinished cast iron and a red handle. The 630 also boasted that it would shred other vegetables so was a must-have gadget. Whilst the marmalade makers would take the leg - or rather arm - work out of the preserving, serious makers would also need a good preserving pan. Solid vintage preserving pans are a must to prevent any marmalades from burning. 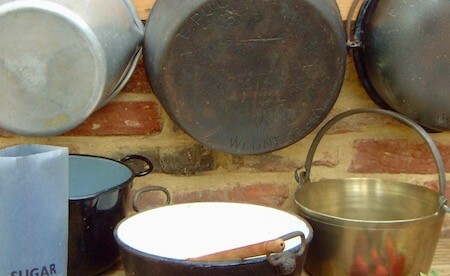 The Victorians loved their big cast iron pans: Often wide and shallow with double handles and lined with white enamel. Sometimes they could be found in copper. Judge used these as a model for their own, but preferring their signature pearl interiors. They made them deeper and had two styles: One for hanging over a fire and the other with double handles. Both had a lip to make pouring easier. Meanwhile, brass preserving pans continued to be used by many households. Smaller than the cast iron ones, they were popular for people making 7lbs or so of preserve. For those who didn&apos;t want to wrestle with a weighty pan, aluminium provided the convenient answer. Mostly deep with a handle and lip, some manufacturers copied the shallow cast iron or copper ones with double handles. So slice, boil, pot and enjoy !